If you're familiar with the ever-popular children's suitcase the Trunki, then you'll be excited to know that there's a new suitcase on the block... that caters to the slightly older generation. The Jurni, a carry-on and ride-on suitcase, is the latest case accompanying teens everywhere. Described as 'the best carry-on suitcase idea we've ever seen' by the Huffington Post, the Jurni is specifically designed to make travelling easier and lighter. And I've got one to give away to a lucky reader! The Jurni is small enough to take on an aeroplane as hand luggage, putting it right at the top of my list for convenience. I always struggle with hand luggage - I usually take a big bag but after an hour or so queuing I'm usually left with sore arms and shoulders. 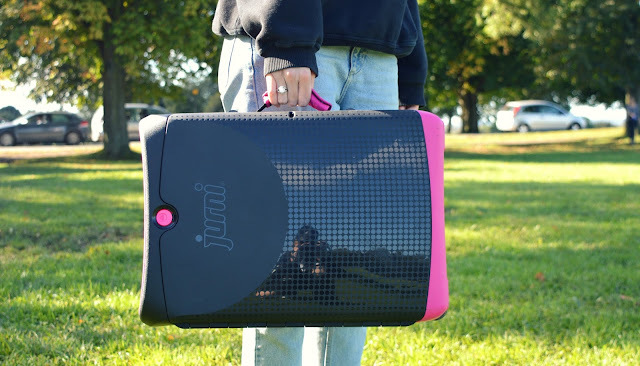 With the Jurni, however, you can sit comfortably on your case with your own portable seat and easily glide through queues, with the inline skate wheels making it a smooth and easy ride. Airports are notorious for their lack of seating and long queues, but having a Jurni eliminates both of those problems - simply sit on your case and let it take you to your destination! 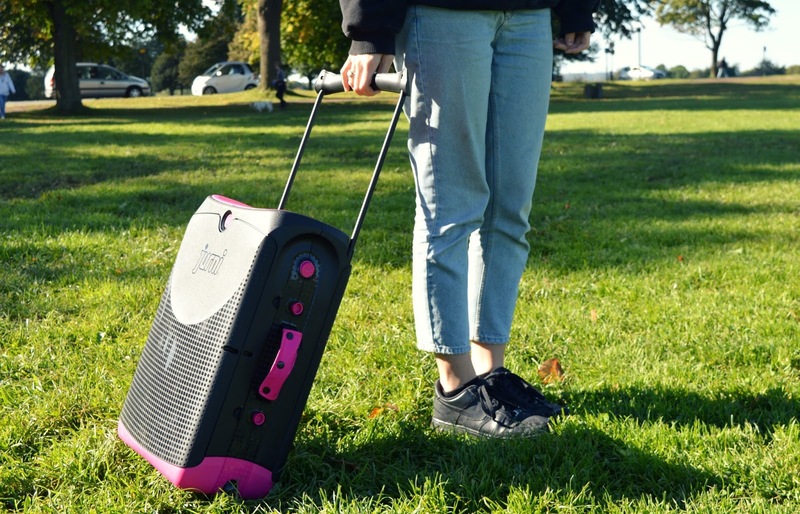 The Jurni has many other features that makes it unique and on the top of every teen traveller's list. To get into the case, you simply push down two buttons on the side and the case pops open. No fiddly or unreliable zips that tend to break on us in the worst situations! 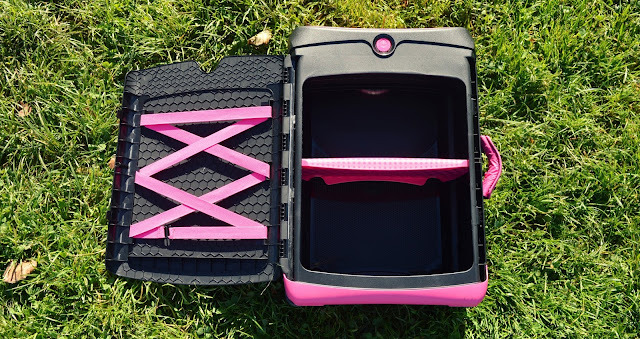 The elastic straps fitted into the inside of the case door is a simple yet brilliant idea - it's the perfect place to store important travel documents, a magazine for the flight or a book for when you reach your holiday destination. I also use it to cleverly store my mini laptop, making it easily accessible at all times. Inside the case is a coloured shelf which can be removed and put back in at your own convenience. The shelf is, again, a simple yet excellent idea, creating an effective and flexible storage option - when you arrive at your destination you can then use your Jurni shelf to pop toiletry bottles or electronics on, creating extra space. The suitcase as a whole is very sturdy and robust, yet is light to pick up and carry - particularly with the comfy side handle and extendable top handle. As the suitcase has hard casing, it means it is difficult to overpack or squeeze those few extra things in there that you could in a soft case. 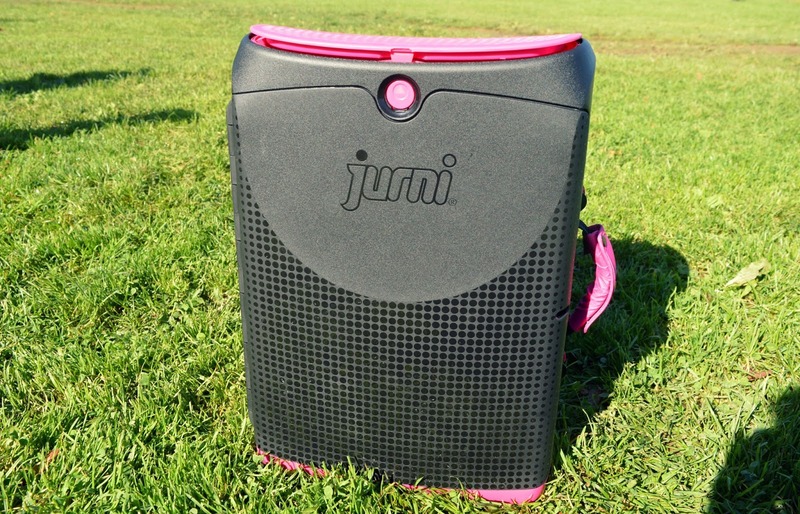 The whole idea behind the Jurni, however, is to just pack the essentials with ease! If you do try to overpack, the Jurni can get too full and pop open - so be careful to not over fill it. Another exciting feature that is extremely useful is the instant access pod situated at the top of the suitcase. You simply press the big pink button, and the pod pops open, providing you with a space to store a few things. The best thing about this little pod is that it allows you to easily access things such as important travel documents, deodorant, phone charger or any other important travel accessory without having to actually go into your case. 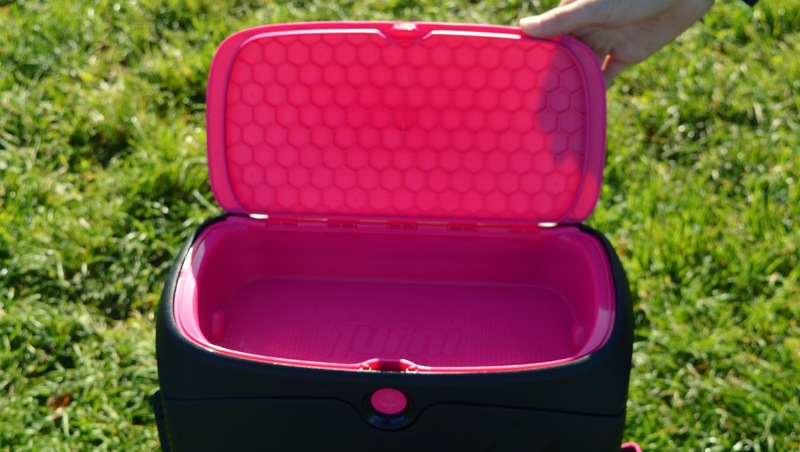 The pod also ejects off the top of the suitcase completely, making it the perfect box to store gadgets - particularly if you're heading down to the pool! Now down to the nitty gritty stuff: the case is officially hand-luggage approved and is made from hard sided polyproplylene (pretty hard stuff if you ask me). It carries a weight of up to 3.2Kg and is 50 x 35 x 20cm, with the seat load holding up to 100Kg. The Jurni is available in three colours: Cobalt Blue, Magma Red or Fusion Pink (like my own Jurni!). Like what you see? Enter my giveaway below for the chance to win a Jurni of your very own, retailing at £79.99. 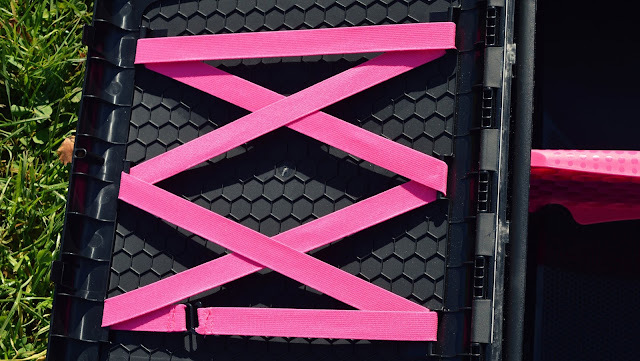 Pack it, pop it, glide it! *The Jurni suitcase was sent to me for review - all opinions are my own. This is so great - I always think those kiddy ones look so fun, so I need one of these in my life! We love our Jurni Suitcase. Sylvia's is blue and it is really versatile. I would take it to Australia a massive journey and will use it for all our trips too. I have never seen a suitcase like this before! I love the wee bit at the top! I would take this on all of my trips! 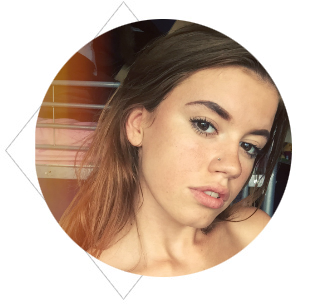 Wow this looks so cool and I entered your giveaway too! This is definitely a cool, compact way of travelling!! How cool is it!! What fun little case, and great value too. I like the different compartments for everything. That is a super cool little case! I take a good few flights a year, but I also take a case whenever I go on shoots so this would be perfect. Oh I love the look of this, what a fab giveaway! This is so cool! I particularly love the little bit at the top - perfect for keeping my travel essentials in! What a wonderful case this is I would love one of these. That is such a great idea, perfect for hand luggage only. This is such a good idea, I need one of these! I've not got one of these, a great way to protect my luggage! I saw someone with one of these and it looked great - perfect for short trips where you don't want to take too much stuff. I do like a dinky case for carry on and something that is sturdy and will last is a big plus point! Great prize. Please allow competition entry via e-mail etc, etc. I would take it on our next trip over to the Isle of Arran - it will be great for the ferry crossing! This would be very useful on a trip to see the family in Vietnam. I would love to take my Jurni to Orlando! We are away for a weekend holiday later in the year. id use it then. I'd very much hope to take it to Orlando, as I really want to take the little man there, but that will involve some sort of miracle or big win! We do take regular family trips in the UK though, so this would be great for our short breaks. Up to the Cairngorns with my friend for a winter getaway! It looks perfect for our upcoming short break in Amsterdam! My son would take it on our trip to Edinburgh. I would take it on a weekend trip to visit my sister. To New York on my next work trip! To Cornwall... we will have an adventure! going on solo adventures to switzerland next year for a child free weekend away! I travel a lot with work this would brighten up dull moments for sure! On my holiday to Benidorm next year! I would take this on a trip to visit my mum. I would take it on a trip around Scotland. To TIMBUKTU & back again. WOW....what a JURNI we'd have together. i havent got anything booked but next timei have a weekend away it would be coming with me ! I'd like to review this on my blog and use it on my next trip, possibly to Abu Dhabi. It would come to Menorca next year!! I travel a lot for work so I am always on the train up and down the country so this would be great for easy access to all my bits and pieces. Home from uni, i.e Bangor to Leeds! I would go to Paris! London, to visit my daughter. And hope she didn't decide it would suit her much more. I would take it to Disneyland Paris in February - my next planned trip! I would go to Jersey with my Jurni! I'd take a Jurni on a fab girls weekend somewhere hot and lovely. Mid week breaks around the UK exploring the best National Trust properties. How brilliant is this! Such striking designs! I really want one for my husband actually as he's mentioned he'd like one now he's flying a lot for work. His next trip is Portugal so I'll say Portugal! If I win this then it will be coming to New York with me in April! Menorca my favourite little Island can not wait till next spring. I would take it to our trip to Australia next year. I would take it on precious weekends away. No holidays planned yet, but I'm sure the new year will bring plenty of opportunities to take it out!